Your play therapy clients will love this fun play therapy activity using a recycled plastic bottle. Children will take this bottle home and show their parents. Parents will think play therapy sessions are awesome! I love this little play therapy activity because it is a fast activity that really works! 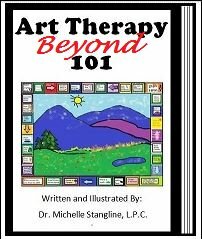 It is the ultimate play therapy activity because it keeps working even after the play therapy client has left your session. 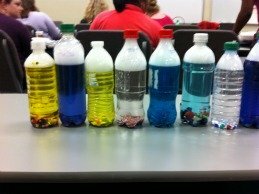 I use recycled bottles for this play therapy activity (love this recycling stuff!). 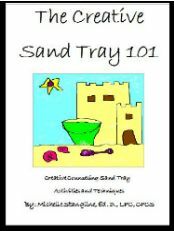 Try this fun play therapy activity as a warm up with your play therapy clients. 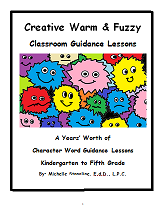 This activity is a great “make and take” activity for all ages. Play Therapy clients can take the bottle home as a reminder of how feelings work, and that “negative feelings” won’t last forever. 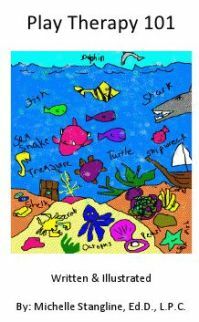 - Small rocks, shells, starfish, etc. 1. After you and your play therapy client have processed the “feelings” felt in the play therapy session ask them if they would like to put those feelings in a special place. I keep all my “feelings bottle” supplies in one carrying caddy. This way I can just grab the caddy and I have everything available for my play therapy clients. 2. Take the label off the plastic water bottle. Add about ¾ worth of water to the bottle. Then take two squirts of dishwashing liquid and put it in the bottle (About 2 tbsp. worth). 3. 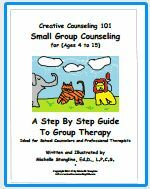 Ask your play therapy client to pick about 5 – 10 (depending on time) small items to add to the bottle. Make sure the items will not disintegrate in the water. As your play therapy client choses each item ask them to talk about what the item means to them as they add these to the bottle. 4. Once all the items are identified, discussed, and processed in the play therapy session bring out the assortment of colored glitter. Ask your client to pick some glitter to add to the bottle and to talk about what feelings might be represented by each glitter color added. For example, red might mean anger; green may mean jealousy, etc. Allow the play therapy client to decide what the colors mean to them. 5. Add two to three drops of blue food coloring to the play therapy feelings bottle. 6. Glue the top on tight. 7. Now, ask your play therapy client to observe the water sitting in the bottle (It should be calm). Explain that most of the time our feelings are “calm” just like the water in the bottle is calm. However, we sometimes feel intense emotions such as happiness, sadness, or anger and this makes our inner feelings bubble up inside of us. 8. Shake up the bottle and explain that when we feel intense emotions (positive or negative) we often feel like this (Water should be bubbling and swirling around). 9. As the water in the bottle is still bubbling, ask your play therapy client to think of some things they can do to calm the water down in the bottle. Most clients will say, “Wait until the bubbles calm down”. Try to brainstorm some healthy coping skills that your client can use when their feelings start to look like the bubbly feeling bottle. 10. The client can take home the play therapy feelings bottle and keep it in a safe place. When they begin to feel upset again they can bring out the feelings bottle, shake it up, and remind themselves that all intense feelings do not last forever. 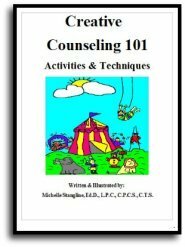 It is also a way the play therapy client can use their newfound coping skills to calm the feelings down.